Top Republican releases Social Security plan. Merry Christmas! Here’s a House Republican Plan to Cut Social Security. 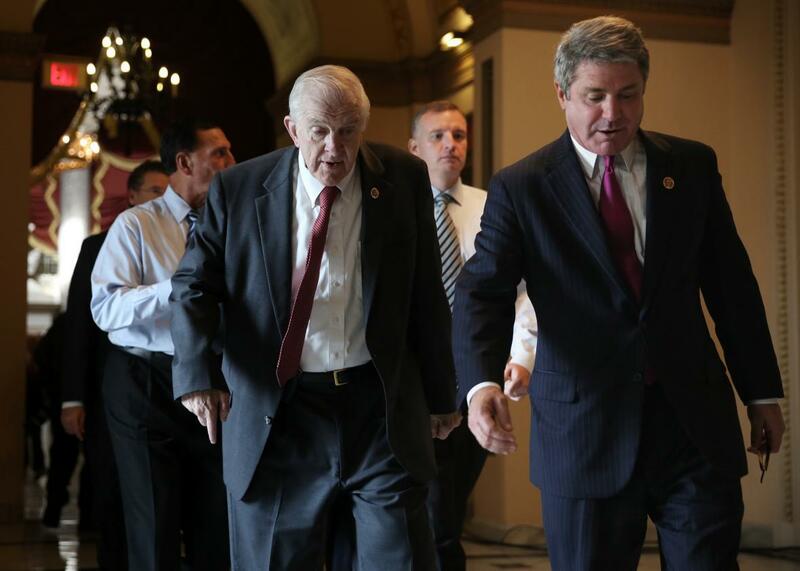 Rep. Sam Johnson, left, in 2013. I had been previously unaware, since Donald Trump promised not to cut Social Security and House Speaker Paul Ryan doesn’t touch it in his “A Better Way” agenda, that we (“we”) were starting a conversation on Social Security anytime soon. But such is life under a unified Republican government. The plan offers a model for what the GOP would do in a Social Security reform effort. The bill includes 15 specific changes, some of them more complex than others, and this letter from the chief auditor of Social Security analyzes each of them. Broadly: It would cut benefits without raising taxes. Some of the more recognizable changes include a gradual increase in the normal retirement age from 67 to 69 for those born in 1968 or later, and it would peg cost-of-living adjustments to chained CPI, a slower-growing inflation index. There are a lot of technical changes to the benefit formula, as well as additional “work incentives.” (None of these changes would affect benefits for anyone currently at the normal retirement age, save for some of the highest earners.) Since implementing these cuts alone would make the law politically unpalatable, it would increase benefits for some of the lowest-income, longest-working earners, while the highest future earners would see the largest benefit cuts. But let’s be clear: most people would see cuts. Look for yourself, on Table B2! I asked Johnson’s office on Friday afternoon if Social Security reform was something House Republicans would actually pursue in 2017, rather than just converse about abstractly. “Congressman Johnson is hopeful this will get the ball rolling on a much-needed conversation,” a spokesperson said. “Doing nothing or simply raising taxes won’t ensure that Social Security continues to be a program that our children and grandchildren can count on, just like seniors and individuals with disabilities do today.” So whether it’s starting a fact-based conversation, or getting the ball rolling on a much-needed conversation, the main point for the near-future seems to be: conversation. I will update if I hear back from Speaker Ryan’s office. “Apparently nothing upsets House Republicans like the idea of hard-working people getting to enjoy a secure and dignified retirement. While Speaker Ryan sharpens his knives for Medicare, Chairman Johnson’s bill is an alarming sign that Republicans are greedily eying devastating cuts to Americans’ Social Security benefits as well. As with Medicare voucherization, Democrats would be terribly, terribly upset if the Republicans made such a politically buccaneering move as trying to cut Social Security.